A number of concurrent SRI evaluations began in 1999-2000 after Chinese researchers learned about SRI 1) from 1999 article by Justin Rabenandrasana (Association Tefy Saina, ATS) in the ILEIA magazine and 2) from seminars by N. Uphoff at China Agricultural University and Nanjing Agricultural University in December 1998 and at IRRI (Los Baños) in March 1999. The first SRI trials were undertaken at Nanjing Agricultural University by Dr. Cao Weixing and colleagues there, followed by evaluations at the China National Hybrid Rice Research and Development Center at Sanya under the direction of Prof. Yuan Longping; at the China National Rice Research Institute (CNRRI) in Hangzhou, Zhejiang province, undertaken by Dr. Zhu Defeng and others; and in Sichuan province by researchers at the Sichuan Academy of Agricultural Science, the Sichuan Agricultural University and other institutions at the suggestion of Prof. Yuan. In April 2002, the first international SRI conference was held in at Sanya, China, hosted by Prof. Yuan and cosponsored by the China National Hybrid Rice Research and Development Center and the China National Rice Research Institute, together with the Cornell International Institute for Food, Agriculture and Development (CIIFAD) and ATS (see conference proceedings with Chinese reports Ang et al; Tao et al; Wang et al; Yan; Zhu et al). A China National SRI Workshop followed in 2003. In Heilungjiong Province, a Chinese version of SRI had already been developed autonomously in the 1990s by the later Prof. Jin Xueyong at Northeast Agricultural University, called the "3S System" for colder climates. In Sichuan Province, a triangular planting system was developed by Liu Zhibin at the Meishan Hybrid Seed Farm, attaining a yield of 16 t/ha, as reported by Prof. Yuan Long Ping at the Sanya conference. In Jiangsu Province, a wheat-rice rotational farming system --SWRI--, has been developed by the Center for Agroecology and Farming Systems in the China Academy of Agricultural Sciences (CAAS). This system uses mulch with SRI plant management on raised beds to control weeds and conserve soil moisture performs well in both normal years and drought years, but relatively better in the latter. The article reported that in a normal year, SRI methods with mulch would raise farmers' net income from 100 yuan/mu ($220/ha) to 600-800 yuan/mu (>$1,500/ha), whereas in a drought year, income could be raised from a net loss of 200-300 yuan/mu (-$550/ha) to a net profit of 300-500 yuan/much ($880/ha). This has important implications for drought-susceptible areas. In Sichuan Province, a mushroom SRI farming system has been developed alternating these crops efficiently and profitably. According to an article in the Journal of Sichuan Agricultural Science and Technology (2009, 2: 23), an SRI adaptation known as "integrated technologies with paddy land cover" incorporates SRI principles. By 2010, the SRI area in Sichuan Province had reached over 301,067 ha, starting from 1,133 ha in 2004. SRI methods were being used in 123 of its 130 rice-growing counties during 2010, making it the leading province for SRI utilization. The average SRI yield over the five-year period on this total area has been 9.2 t/ha, representing an average increase of 1.63 t/ha over rice cultivation in the province with current methods. The 2010 status of SRI in China and Korea was presented at a Workshop on the System of Rice Intensification, Exchanging Experience in China, the Democratic People's Republic of Korea and Internationally, that was held February 28-March 2, 2010, in Hangzhou, China. While the sections below report on SRI progress primarily in English, much research and reporting on SRI is in Chinese language; what Chinese scientists and practitioners have learned about SRI is very incompletely known outside China. In order to gain a better understanding of the SRI-related research carried out over the past decade in China, SRI-Rice collected research articles in both Chinese and English, translated Chinese abstracts and metadata, and have made these available on our SRI-Rice website (see chronological list and searchable China SRI Zotero database). As of 2013, SRI-Rice had located 140 research articles from 47 research institutions, universities, government agriculture stations, and companies. By May 2014, we had located from 294 research and evaluation articles from 272 of these entities. On October 31, 2014, Zhoucen Feng presented a review of 313 journal articles on SRI published in 72 journals between 2000 and 2013 at the 4th International Rice Congress (IRC) in Bangkok, Thailand. The primary topics of the articles were planting density, nutrient management, seedling age, and varietal response. A number SRI adaptations, such as the triangular planting patterns for low light-intensity areas, no-till, raised beds with mulch, and duck-rice systems, were described in the presentation. For details, see the item below or Feng and Styger's PowerPoint presentation. 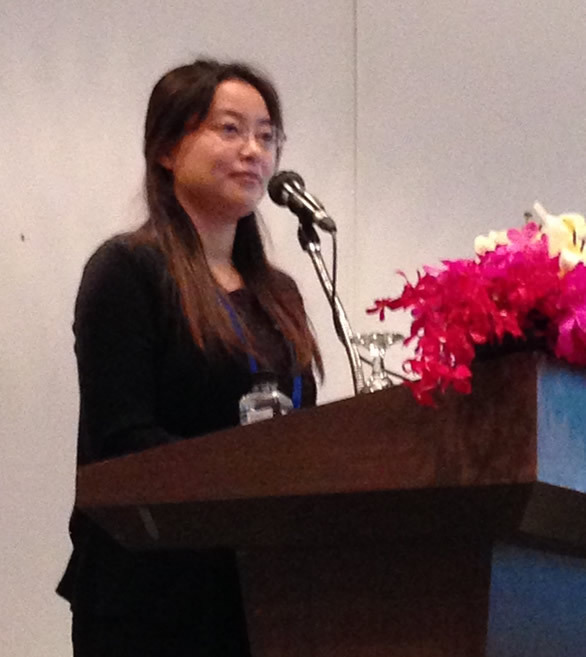 [November 10, 2014] Zhoucen Feng (right) presented a review of published Chinese research on SRI between 2000 and 2013 at the 4th International Rice Congress (IRC), held in Bangkok, Thailand, October 31, 2014. She reviewed 313 journal articles (in 72 journals), 13 dissertations, 11 articles in conference proceedings. Of the 576 total journal articles worldwide SRI-Rice has found, 313 articles were from China; these included 244 research articles (219 on field experiments, 25 reviews) and 69 technical recommendations. The peak of journal articles occurred in 2005, with an increasing ratio over time of technical recommendations to research work. During the first few years after SRI was introduced into China (Phase 1), SRI research primarily focused on agronomic variations and physiological processes' influence on yield. During Phase 2 studies were directed more toward delivering technical recommendations for specific farming conditions. While results from 93 experiment sites appeared in publications that represented all 19 rice-producing provinces in China (see map), trials were concentrated in a few provinces; Zhejiang and Sichuan produced the most research. The authors of the articles represented various universities and research institutes as well as the Department of Agriculture, agricultural extension services, seed companies. Some of the studies were inter-institutional collaborations. There were four main topics considered in the journal articles: Planting density, nutrient management, seedling age, and varietal response (many of them hybrids). Other topics included weed, other pest, and water management, temperature, etc. SRI has been chosen as one of the “Major Agricultural Technologies to Promote of the year” by the Department of Agriculture in Zhejiang and Sichuan since 2010. Adaptations studies in research publications included triangle planting patterns (designed for low light intensity condition in Sichuan Province), no-till SRI (some combined with raised beds), direct-seeding SRI, incorporating mulch (rice hull or plastic) into SRI systems, and SRI rice-duck system. Many research results have been mainstreamed into technical recommendations for rice production. For more information, see the presentation by Feng and Styger. The abstracts, titles and authors of articles that are only available in Chinese have been translated by members of our China project team (Zhoucen Feng and Xingyu Luo with input from Weifen Qiu) over the past three years, so if you don't speak Chinese, you can still learn what is going on! The SRI-Rice China collection, which is currently being updated by our staff, can be accessed through 1) a chronological bibliographic list, 2) a searchable China SRI RefWorks database, or 3) by selecting the China tag in the Mendeley-based SRI Global Research Network website. (Additional Notes on accessing research: 1) By joining the SRI Global Research Network you can be notified when new research is published. 2) While full text versions of much of the peer-reviewed literature cannot be accessed without subscription, the abstracts of most are available through the China RefWorks database. --Click on the magnifying glass icon to see the extended view of the metadata, which includes abstracts, urls and other information). [March 2013] The March 2013 issue of LEISA China (right) looks at the current use of and debates around System of Rice Intensification, (SRI). This Chinese language magazine includes a a fascinating case study of innovation from below,involving local authorities, "champions," extension agents and millions of farmers. One of the articles ( 水稻超高产强化栽培技术体系 在四川的实践) discusses SRI in Sichuan. The magazine also includes articles from India, Myanmar, Nepal, Latin America and other countries. LEISA China is a member of the AgriCultures Network. According to Weijian Zhang, from the Institute of Crop Sciences at the Chinese Academy of Agricultural Sciences in Beijing, the area in China using System of Rice Intensification (SRI) methods will exceed 900,000 hectares in 2012, up from 700,000 in 2011 and 200,000 in 2007. CNRRI officials further reported that SRI usually achieves 8 to 11 tons per hectare in China, higher than the national average of 6.6 tons, or the world average of 4.4 tons per hectare. Zhu Defeng, a principal scientist at the Hangzhou-based China National Rice Research Institute (CNRRI) added that SRI is becoming the main rice cultivation system in most of southern China. (See article in the Thailand Business News for details). SRI-related research carried out over the past decade in China has been collected by the SRI-Rice Center and made available on our website. While many the articles we found are written entirely in Chinese, we have translated the titles, authors and abstracts of many of those without English metadata in order to make them accessible to a wider audience. As of March 2012, articles are available online in 1) a chronological listing and 2) a searchable China SRI RefWorks database. The bulk of the 86 articles listed in both sources are accessible online. 2015 . 用自然农法从事农业生产能赚钱吗？必须能！(Using natural farming production can make money? You must be able!) Utopia website. October 30. 2013. 水稻超高产强化栽培技术体系 在四川的实践 The practice of System of Rice Intensification (SRI) in Sichuan. LEISA China 7(1): 12-13. Fisher, Lucy. 2012. CHINA: Research articles about the System of Rice Intensification (SRI) in China now available on the SRI-Rice website March. Li, Zhong. 2012. The system of rice intensification (SRI) is gaining ground in Asia. Thai Business News, May 15. Yuan, L. P. 2002. A scientist's perspective on experience with SRI in China for raising the yields of super hybrid rice. Paper presented at the international conference Assessments of the System of Rice Intensification (SRI), April 1-4, in Sanya, China. Qingquan, Yan. 2002. The System of Rice Intensification and its use with hybrid rice varieties in China. Paper presented at the international conference Assessments of the System of Rice Intensification (SRI), April 1-4, in Sanya, China. Organized and hosted by the China National Rice Research Institute (CNRRI), with support from The Asia Foundation. 2013 (March 25). System of Rice Intensification Practices - 农广天地]水稻强化栽培技术. 24:38 min. CCTV channel 7 (Agriculture Channel), China [This Chinese SRI adaptation, known as the Triangular SRI system, suggests transplanting single seedlings from plastic trays at 2- to 4-leaf stage in a triangular pattern (3 hills to a unit, forming a small triangle with 6~10 cm between each other; 25~50cm between each unit). AWD and a mix of compost and inorganic fertilizer are used]. Feng, Zhoucen, and Erika Styger. 2014. System of Rice Intensification in China: Research dynamic and innovative adaptations. - PowerPoint presentation by Zhoucen Feng at the 4th International Rice Congress, Bangkok International Trade and Exhibition Centre (BITEC), Bangkok, Thailand, October 27-31. 19 slides. - Powerpoint presentation by Zheng Jiaguo, Sichuan Academy of Agricultural Sciences. 51 slides. Jia-guo Zheng, Xin-lu Jiang, and Zhong-zhi Chi Sichuan Academy of Agricultural Sciences. 57 slides. Jin Zhengxun, Northeast Agricultural University Haerbin. 38 slides. Sichuan PDA SRI report. 33 slides. - pdf file of PowerPoint presentation; This system is similar in many ways to SRI -- developed by Prof. Jin Xueyong, Northeast Agricultural University, for cold northern climates (Heilungjiong Province, Northern China). 13 slides.